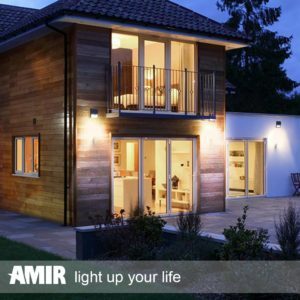 The AMIR Outdoor Solar Lights are your standard motion sensor wall lights, with a few nice features. It currently holds a 4.3 on Amazon.com with a 75% approval rating. Interestingly enough, only 6% of customers had negative things to say about it. So, let's check out why is it getting so well received. The AMIR outdoor solar lights have the perfect balance between quality, durability, and convenience. They are really what you would expect out of a motion sensor wall light. First off, the light is very bright. It features 16 LEDs which all together put out 250 lumens. For 16 LEDs, 250 is a bit low. Other outdoor solar lights have only 4 or 8 LEDs included and put out the same brightness. That paired with the 3.7V/2200mAh Li-ion batteries means that you will not have to worry about the lights lasting throughout the night. Even on their full setting, when the light is constantly on, the battery will last the entire night when fully charged. However, depending on the mode you need, you may not have to worry about that. The solar panels that are included with the AMIR outdoor solar lights are efficient and of good quality. They are made from PET/EVA Polycrystalline solar cells and have a conversion rate of 17%. Even though that is slightly lower than some of the other outdoor solar lights we have reviewed, the size of the battery makes the 17% conversion rate perfectly fine. The PET material makes the solar panels resistant to water and high temperatures. Also, the EVA technology that these solar panels use, ensures that their efficiency will not drop for more than 5 years. So there is no need to worry about any harm coming to your panels in any weather situation or over time. Like many other outdoor solar lights, the AMIR outdoor solar light has a few features that do their best to make the device standout from the others. Besides the durable body and solar panel, this light also has multiple lighting modes, a motion sensor, and an unique angle of its solar panel. I touched on the multiple lighting modes earlier. You can switch the device between "Auto on at night/auto off at sunrise" or "Dim light when no motion/bright light when sensing motion within 3 meters." However, there is no setting which only uses the motion sensor. You you are either stuck with the light always on, or a dim light with the motion sensor. However, the dim light is good if you do not always want a bright light. So there's that. The other unique feature of these lights are the angle of the solar panel. While most solar lights angle the panel at 45 degrees, the AMIR outdoor solar lights angle it at 60 degrees. This is supposedly to allow for better sunlight absorption and makes for longer running time. AMIR Technology Co., Ltd. was founded in 2014 in Shenzhen, China. They specialize in overseas import and export of tech products. Mostly in home accessories like lighting and kitchen appliances. However, they also deal in cell phone accessories. They have dealings all over the world with most of their business done in the US, Canada, UK, France, and Spain. They have a 98% approval rating on Amazon, with only 1% of the reviews of all of their products being negative. These lights also include a pretty big 2200mAh li-ion battery which is included with the package. You will not have to worry about that battery running out over night, even at its highest setting. The solar panel is made out of very durable PET polycrystalline material. Water and heat resistant. The panel also uses EVA technology that keeps the solar cell's efficiency at its base of 17% for more than 5 years. The solar panel is also angled at 60 degrees instead of the common 45 degrees. This is meant for a more efficient absorption rate, resulting in a longer active time during the night. The entire outdoor solar light is IP64 waterproof. Whether it be rain, snow or any other weather situation, these lights will work perfectly. They are very easy to install. The package includes two screws that can be placed at in the top of the solar light for simple mounting on any wall. The multiple light modes are nice if you do not want the full 250 lumens throughout the night. Plus, the dim light setting makes use of the motion sensor. While the multiple lighting modes is a nice feature, there is no mode that solely makes use of the motion sensor. So there is no option for the light to remain off until motion is sensed. That kind of lighting mode would have been nice to see. 250 lumens for 16 LEDs is surprisingly low. Would expect 16 LEDs to put out well over double that. The AMIR Outdoor Solar Light greatly balances convenience with power and durability. It is really everything you would expect from an outdoor wall light. Great brightness, weather protection, a motion sensor, and a good battery. All make for an overall decent outdoor solar light. Of course, if you want to use this for anything other than convenience lighting, like security, you may be a bit disappointed. Overall, the AMIR Outdoor Solar Lights are a good quality light that will provide decent light and reliability throughout the night. Not to mention it is very cheap. Right now you can pick up the AMIR Outdoor Solar lights for $14.99. However, you do only get one light with each purchase. Luckily, the price is low enough that you can buy 4 of these for under $100. For more information regarding outdoor solar lights or solar energy in general, check out the rest of Green and Growing. Here are some top questions that I found for people seriously considering buying the AMIR outdoor solar lights. How long does the bright light stay on for? It activates for 30 seconds when motion is sensed, then goes back to dim. How long will the light stay on during the night? It can easily last the entire night. What color light does this emit? It puts out a bright white light.